Kawai - Yamaha - Steinway . A proper Piano Stool must be included. The Piano must be tuned on delivery AND on the afternoon of the concert before soundcheck. We mike the piano, most often, with 2 crown mikes ( Soundboard and Lid) . 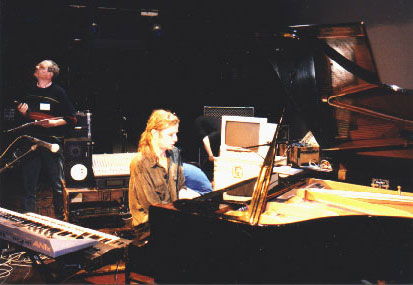 Double Keyboard stand or 2 keyboard stands. Stage Lighting is Left to the venue - unless it's a Crystal Machine concert. COMPUTER For the Two magick tours of the USA- we used an americain computer. The are specifications here ! It has been suggested that an identical computer is used , and we just slip in Tim's Disks and Sound card. In this case - probably for a tour of 4-10 dates, a rehersal to iron out the bugs is hoped for! Venue's sound desk. (8 -4-2) or combinations. A lot depends on the amount of soundcheck available. The two Vocal mikes & the two piano mikes go to the venue sound system in the usual way. 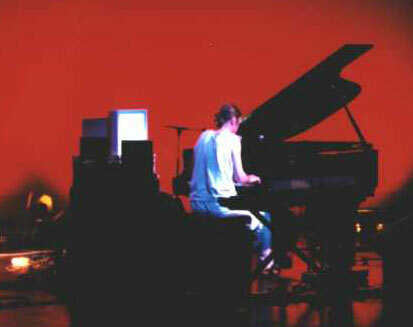 In VERY LARGE rock Concerts, Tim has used Yamaha Cp88 Pianos or even Digital. For 'theatre ' concerts this is a shame !